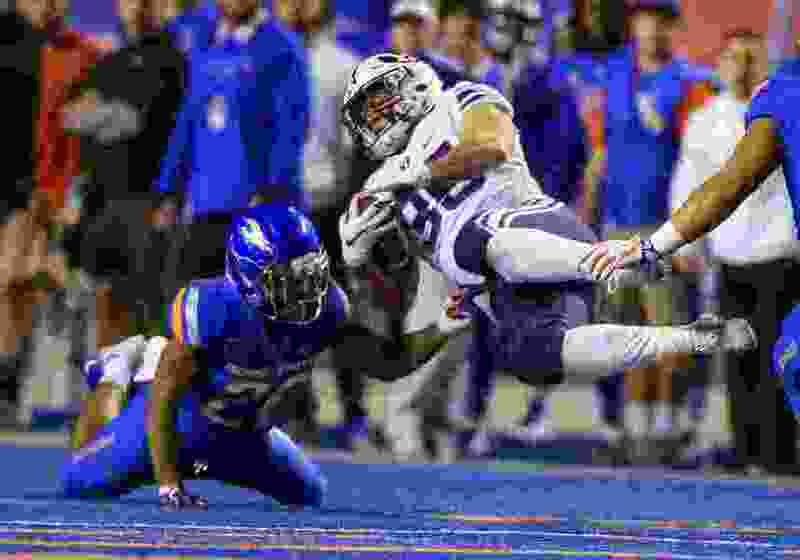 Boise • Jeff Grimes deserves credit for calling the screen play that went for 59 yards and put BYU into position to upset Boise State late Saturday night. But the Cougars’ first-year offensive coordinator, along with third-year head coach Kalani Sitake, deserve a good portion of the blame for mismanaging the clock and and making some questionable play calls once BYU got there in the eventual 21-16 loss. Some of the decisions Grimes and Sitake made in the final minute were head-scratchers. First, the coaches let too much time run off the clock in the final minute before taking a timeout, a decision that came back to bite them when freshman quarterback Zach Wilson was tackled on the 4-yard line as time expired. After Lopini Katoa ran 8 yards to the BSU 5, Grimes apparently called two running plays, and Matt Hadley — responsible for the 59-yard catch-and-run that put the Cougars at the 24 — couldn’t gain a yard on either carry. “Try to get a touchdown,” Sitake said when asked what BYU’s plan was on those plays that were not only snuffed but cost the team precious seconds on the clock. More second-guessing: During the timeout that Boise State called with seven seconds left and the ball on the 2, why didn’t BYU coaches stress to Wilson that he had to get rid of the ball as quickly as possible? “To be honest, it didn’t cross my mind,” he said after throwing for 252 yards. • BYU’s red-zone offense still needs a lot of work. The Cougars moved the ball inside the BSU 20 six times and went away with just 13 points — two field goals and a touchdown. • Coaches made the right decision when they replaced senior Tanner Mangum with Wilson two games ago. Sure, the 19-year-old was sacked seven times. But the less-mobile Mangum might have been sacked 10 times. Wilson kept several plays alive with his legs, and would have rushed for 90 yards if sacks didn’t count against rushing yardage in college stats. • BYU’s offensive line continues to regress. Wilson has been sacked 12 times in the last two games. Hard to win that way. Holding penalties and false starts also killed or hampered BYU drives Saturday night. The Cougars rushed for minus-5 yards the first half and finished with a meager 96. “I feel like we are working to make strides every single week and do the best we can,” said Hadley. * Boise State’s Tyler Horton forced and recovered a fumble after BYU tight end Matt Bushman caught a 37-yard pass from Neil Pau’u. Bushman made a spectacular one-handed grab but he lost the ball at the 3 and it rolled into the end zone, where Horton pounced on it. • BYU cornerback Michael Shelton drew some ire Tuesday when he said playing at LaVell Edwards Stadium was a “downer” because of the lack of energy from the fans. But he backed up his words away from LES. The senior made six tackles, returned an interception 31 yards to set up a field goal, and also returned a punt well into BSU territory that was called back by a penalty. The Cougars dropped to 4-5 and will need to win two of their final three games to get bowl eligible. They play UMass at Gillette Stadium in Foxborough, Mass., at 10 a.m. MST Saturday before returning to Provo to face New Mexico State on Nov. 17.